And thus begins a pen palship. After a rather stressful final term of grad school, I decided to pick up a nice and relaxing anime series that I found in the form of Aria: the Animation. Aria: the Animation follows the undines (women who give gondola tours) of its titular company as well as those of others as they learn to make tours of Neo-Venezia a little more enjoyable for the rest of us. Aria takes place on a planet called Aqua, which is actually a terraformed Mars, and the main character is Mizunashi Akari, a girl who recently moved here from Earth (or Manhome as they call it in the series) with the intention of becoming an undine in Neo-Venezia. As you probably guessed, Neo-Venezia is the new Venice. In the first episode, Akari meets a young girl from Ai who returns to Manhome at the end of the episode. The series took an interesting approach from that point on by bookending the subsequent episodes with Akari narrating an email she wrote to her newfound penpal. The series shows us Akari as well as fellow undines Aika and Alice as they learn more about their trade as well as themselves. Aria: the Animation was very episodic in nature, even more so than other slice-of-life anime I’ve seen like Piano or Nodame Cantabile. Given the nature of the series, it’s not surprising since Akari is narrating “This is what happened to me today” type emails to Ai. Thus, Aria: the Animation fell back on its characters to drive what was going on. Akari is the single most optimistic character I’ve ever seen in an anime. She was perpetually in a state of happy, seemingly able to come up with something positive no matter what her situation was. Aika is a bit more hot-headed, endlessly striving to be the greatest undine ever. Alice…just tended to occasionally voice her annoyance of other people. In a series with only three leading characters, it really hurts when one of them is a lot less interesting than the other two. Akari and Aika wound up carrying the series by themselves. There were some supporting characters, but I think only one of them appeared for more than two of the thirteen episodes this series was. Alice had her moments, namely in one episode where she was frustrated with her clumsy roommate, but that was basically the most memorable thing to have happened to her. As a whole, Aria: the Animation’s episodes really varied in quality. There were some great, character and world-building episodes. What comes to mind are the last three episodes, which do a great job of doing both. I got to learn a bit more about the history of the undine companies. I got to learn a bit about the history of Aqua. I also got to see a bit of Neo-Venezian culture as they celebrated the new year. On the other hand, you would have completely useless episodes like our heroines going to an onsen for no reason. There wasn’t even any fan service because Aria: the Animation is the most G-rated anime series I’ve seen in a while. Overall, Aria: the Animation is so relaxing that it might cure some of you of post-traumatic stress disorder. Unfortunately, some of you may also be cured of insomnia. Even though Aria: the Animation was only 13 episodes long, it was a little too long for its own good. It would’ve gone a lot smoother if episodes like that onsen episode were cut. There were also a few jokes, like Akari saying something sappy to which Aika would respond, “Sappy lines aren’t allowed!” and Akari would make a reaction face, that were run right into the ground as the series progressed. Not only that, but the animation suffered for it. 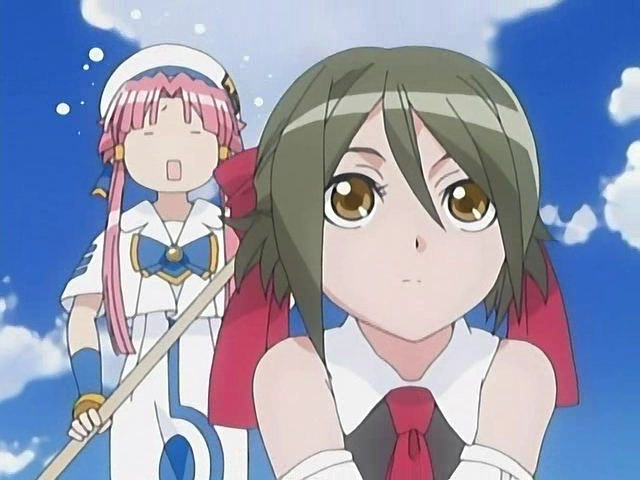 Aria’s animation didn’t start as something you could consider to be great, even for a series from 2006, but it becomes clear the series had gone over budget at about the 75% mark when you see some clear cost-cutting measures. One thing I started noticing was instances of one character doing absolutely nothing to indicate to me that she is in fact alive as another character talks for an extended period of time. It was something I found irksome in Mahha Go Go (better known in the States as Speed Racer), and that was an anime series from the 1960s. It’s absolutely unacceptable in one from 2006. The last episode also used a montage of still cels to illustrate the new year celebration. It’s a shame because Aria: the Animation featured some absolutely gorgeous character designs. Still shots of the show are a real treat to look at. I saw our three leads making reaction faces a little more often than I would’ve liked, and I suspect it’s because it would’ve been cheaper to animate that way. It’s unfortunate because the characters are very pleasant to look at when they are making normal faces. Pleasant is how I would describe Aria: the Animation in general. The series will have a very calming effect, and you won’t need to look any further than the show’s opening theme, simply entitled “Undine” and sung by Makino Yui. Aria: the Animation’s best aspect, by and far, was its soundtrack. The music was very understated in general, but it made enough of an impression on me that the music alone is what’s stopping me from really disliking this series. I strongly suspect I would’ve enjoyed this series a lot more if it was not a series at all, but perhaps a 5 or 6-part OVA. I think the story (or lack thereof) would’ve benefited from having some fat trimmed off, and the episodes themselves could definitely have used a more generous animation budget. Finally, the series did hint at Aqua having some supernatural aspect, namely by having Akari travel into the past a few times. I would’ve liked to see that and Neo-Venezia’s culture explored a bit more in-depth.